Mac Bethad mac Findláich, known in English as Macbeth c. 1005 – August 15, 1057 was King of Scots (or of Alba) from 1040 until his death. 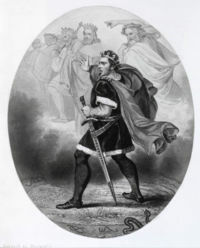 He is best known as the subject of William Shakespeare's tragedy Macbeth and the many works it has inspired, although the play itself is of limited historical accuracy. Mac Bethad was the son of Findláech mac Ruaidrí, mormaer of Moray. His mother is sometimes supposed to have been a daughter of Máel Coluim mac Cináeda. This may be derived from Andrew of Wyntoun's Orygynale Cronykil of Scotland which makes Mac Bethad's mother a grand-daughter, rather than a daughter, of Máel Coluim. Mac Bethad son of Findláech son of Ruadrí son of Domnall son of Morggán son of Cathamal son of Ruadrí son of Ailgelach son of Ferchar son of Fergus son of Nechtan son of Colmán son of Báetán son of Eochaid son of Muiredach son of Loarn son of Ercc son of Eochaid Muinremuir. This should be compared with the ancestry claimed for Máel Coluim mac Cináeda which traces back to Loarn's brother Fergus Mór. Several of Mac Bethad's ancestors can tentatively be identified: Ailgelach son of Ferchar as Ainbcellach mac Ferchair and Ferchar son of Fergus (correctly, son of Feredach son of Fergus) as Ferchar Fota, while Muiredach son of Loarn mac Eirc, his son Eochaid and Eochaid's son Báetán are given in the Senchus fer n-Alban. So, while the descendants of Cináed mac Ailpín saw themselves as coming off the Cenél nGabráin of Dál Riata, the northern kings of Moray traced their origins back to the rival Cenél Loairn. Mac Bethad's father Findláech was killed c. 1020 - one obit calls him king of Alba - most probably by his successor, his brother Máel Brigte's son Máel Coluim. Máel Coluim died in 1029, the circumstances are unknown, but violence is not suggested; he is called king of Alba by the Annals of Tigernach. However, king of Alba is by no means the most impressive title used by the Irish annals. Many deaths reported in Irish annals in the 11th century are of rulers called Ard Rí Alban - High-King of Scotland. It is not entirely certain whether Máel Coluim was followed by his brother Gille Coemgáin or by Mac Bethad. Gille Coemgáin son of Máel Brigte, mormaer of Moray, was burned together with fifty people. Some have supposed that Mac Bethad was the perpetrator. Others have noted the lack of information in the Annals, and the subsequent killings at the behest of Máel Coluim mac Cináeda to suggest other answers. Gille Coemgáin had been married to Gruoch, daughter of Boite mac Cináeda, with whom he had a son, the future king Lulach. It is not clear whether Gruoch's father was a son of Cináed mac Duib (d. 1005) or of Cináed mac Maíl Coluim (d. 997), either is possible chronologically. After Gille Coemgáin's death, Mac Bethad married his widow and took Lulach as his step-son. Gruoch's brother, or nephew, his name is not recorded, was killed in 1033 by Máel Coluim mac Cináeda. Máel Coluim son of Cináed, king of Alba, the honour of western Europe, died. Máel Coluim's grandson, Donnchad mac Crínáin, was acclaimed as king of Alba on 30 November 1034, apparently without opposition. Donnchad appears to have been tánaise ríg, the king in waiting, so that far from being an abandonment of tanistry, his kingship was a vindication of the practice. Previous successions had involved strife between various rígdomna - men of royal blood. Far from being the aged King Duncan of Shakespeare's play, the real Donnchad was a young man in 1034, and even at his death in 1040 his youthfulness is remarked upon. Perhaps due to his youth, Donnchad's early reign was unremarkable. His later reign, in line with his description as "the man of many sorrows" in the Prophecy of Berchán, was not successful. In 1039, Strathclyde was attacked by the Northumbrians, and a retaliatory raid led by Donnchad against Durham in 1040 turned into a disaster. Later in 1040, Donnchad led an army into Moray, where he was killed by Mac Bethad on 15 August, at Pitgaveny near Elgin. On Donnchad's death, Mac Bethad became king. No resistance is known at this time, but it would be entirely normal if his reign were not universally accepted. In 1045, Donnchad's father Crínán was killed in a battle between two Scots armies. John of Fordun wrote that Donnchad's wife fled Scotland, taking her children, including the future kings Máel Coluim III and Domnall III with her. Based on the author's beliefs as to whom Donnchad married, various places of exile, Northumbria and Orkney among them, have been proposed. However, the simplest solution is that offered long ago by E. William Robertson: the safest place for Donnchad's widow and her children would be with her or Donnchad's kin and supporters in Atholl. After the defeat of Crínán, Mac Bethad was evidently unchallenged. Marianus Scotus tells how the king made a pilgrimage to Rome in 1050, where, Marianus says, he gave money to the poor as if it were seed. In 1052, he found himself involved indirectly in the strife in the Kingdom of England between Godwin, Earl of Wessex and Edward the Confessor when he received a number of Norman exiles from England in his court, perhaps becoming the first king of Scots to introduce feudalism to Scotland. In 1054, Edward's Earl of Northumbria, Siward, led a very large invasion of Scotland. The campaign led to a bloody battle in which the Annals of Ulster report 3000 Scots and 1500 English dead, which can be taken as meaning very many on both sides, and one of Siward's sons and a son-in-law were among the dead. The result of the invasion was that Máel Coluim - not Máel Coluim (III) mac Donnchada - "son of the king of the Cumbrians" was restored to his throne, i.e. as ruler of kingdom of Strathclyde. It may be that events of 1054 are responsible for the idea, which appears in Shakespeare's play, that Máel Coluim III was put in power by the English. Mac Bethad certainly survived the English invasion, for he was defeated and mortally wounded or killed by Máel Coluim mac Donnchada in battle at Lumphanan, on the north side of the Mounth in 1057. The Prophecy of Berchán has it that he was wounded and died at Scone, sixty miles to the south, some days later. Mac Bethad's stepson Lulach mac Gille Coemgáin was installed as king soon after. The red, tall, golden-haired one, he will be pleasant to me among them; Scotland will be brimful west and east during the reign of the furious red one. Mac Bethad's life, like that of Donnchad, had progressed far towards legend by the end of the 14th century, when John of Fordun and Andrew of Wyntoun wrote their histories. Hector Boece, Walter Bower and George Buchanan all contributed to the legend. The influence of William Shakespeare's Macbeth towers over mere histories, and has made the name of Macbeth infamous. Even his wife has gained some fame along the way, lending her Shakespeare-given title to a short story by Nikolai Leskov and the opera by Dmitri Shostakovich entitled Lady Macbeth of Mtsensk. The historical content of Shakespeare's play is drawn from Holinshed's Chronicles of England, Scotland, and Ireland, which in turn borrows from Hector Boece's 1527 Scotorum Historiae which flattered the antecedents of Boece's patron, king James V of Scotland. In modern times, Dorothy Dunnett's novel King Hereafter aims to portray a historical Macbeth, but proposes that Mac Bethad and his rival and sometime ally Thorfinn of Orkney are one and the same (Thorfinn is his birth name and Macbeth is his baptismal name). John Cargill Thompson's play Macbeth Speaks 1997, a reworking of his earlier Macbeth Speaks, is a monologue delivered by the historical Macbeth, aware of what Shakespeare and posterity have done to him. Macbeth is also a recurring character in animated television series Gargoyles in which his reign is portrayed sympathetically, and his success is a result of an alliance with the titular creatures.